PTFE Metallic Scrapers: Case Study - Eclipse Engineering, Inc.
Rod scrapers, wipers, and excluders are common place in the seal industry. A wiper or scraper can be a critical part of keeping dust, dirt, and debris out of a hydraulic system. While a polymer scraper such as a filled PTFE can provide many years of low-friction performance, some extreme applications need a more robust and aggressive design. Eclipse chose a specific, unhardened grade of stainless steel for the metallic scraper. The unhardened stainless steel provided aggressive rod scraping while reducing the risk of damaging the cylinder shaft. Eclipse was approached by a customer using a hydraulic cylinder in a metal foundry. Intense heat and marring media presented a challenging environment for any seal component. The cylinder was close enough to the molten metal to get slag deposits on the cylinder rod when fully extended. Slag, a by-product of the smelting process, is often a mixture of metal and silicon oxides. The hard and abrasive properties of the slag were pushing conventional rod wipers and scrapers beyond their limits and allowing damaging contaminates into the hydraulic system. Frequent rebuilds and service delays were commonplace. Eclipse was posed with a challenge to invent a scraping system that was up to the task. Polymer scrapers can be designed to withstand harsh environments. Dirt, rocks, and mud are usually effectively kept out of hydraulic systems by using polymer or plastic wipers. Eclipse’s EU000: UHMW-PE is an exceptionally tough polymer that can withstand tearing, impact, and abrasion in a wide variety of situations. But even UHMW wouldn’t be effective for hardened slag. The abrasiveness combined with the intense 500°F plus environment ruled out the use of almost any polymer. Eclipse knew it had no choice but to fight fire with fire. And while metallic scraper rings are available, the unique environment of the foundry also effectively excluded them from use. A typical metallic scraper uses a rubber or Nitrile element to both center the metallic scraping ring and allow for radial movement of the shaft. Using a metal scraper on a shaft without an element to allow for some “give” could result in high friction and damaging galling or marring of the cylinder shaft. 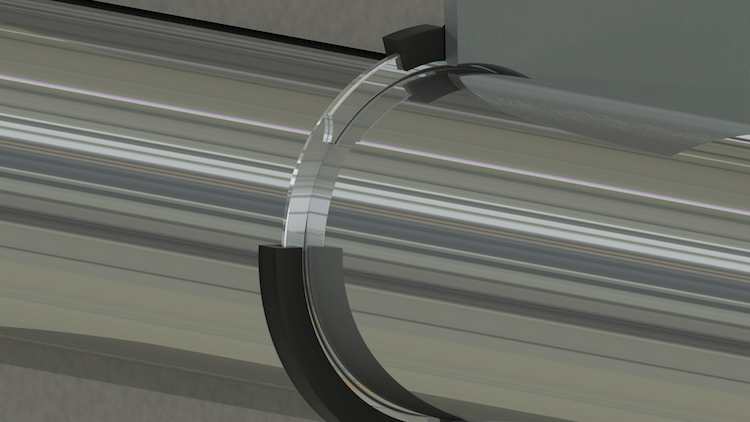 Often used in large industrial applications, shaft alignment and precision could be less than perfect. A hard-mounted metal scraper could easily damage the shaft if misalignment is present. A long axial scratch or gouge in the shaft would almost certainly cause leakage in the hydraulic system and be a costly repair. But in an environment over 500°F, having a rubber element in the scraper would not be possible. With the extreme temperature ruling out the use of any rubber or elastomeric compound, Eclipse knew it would have to substitute a material for the centering and movement absorbing element used with the metal scraper ring. Eclipse chose its ET006: Carbon filled PTFE to fill this role. The combination of a stainless-steel scraping ring and a PTFE centering jacket proved to be an effective solution to the customer’s unique application. The high temperature capability of the PTFE meant a metallic scraping ring could be used without risk of severe damage to the cylinder shaft and thusly, maximum scraping effectiveness could be used. The Eclipse Metallic Scraper ring efficiently removed any slag deposits from the shaft, ensuring the sensitive internal sealing components remained free of damaging contamination. While a polymer scraper, wiper, or excluder might work for the majority of industry applications, extreme conditions might mean the next level of scraping aggressiveness could be necessary. A metallic scraping ring can withstand the harshest of media and could be essential in prolonging life of the sealing system. 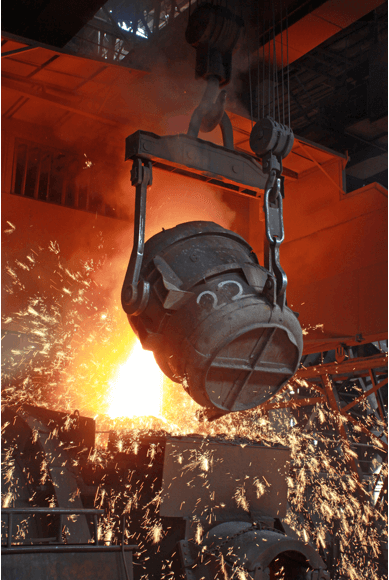 While removing slag from a hydraulic cylinder shaft in a foundry is a perfect application for an Eclipse Metallic Scraper ring, a wide variety of situations could merit their use. Eclipse has specified metallic scrapers for use in applications of the other end of the temperature scale as well. Another Eclipse client used a hydraulic cylinder on a bridge application where the cylinder location was prone to heavy icing conditions in the winter months. The metallic scraper effectively removed any ice from the shaft, while the PTFE jacket provided the benefits of having an indefinite shelf-life and no UV degradation. This meant extremely long service life and maintenance free operation for many years when compared to a scraper using rubber or Nitrile elements. Another application well suited for an Eclipse Metallic Scraper was for a cylinder at a loading dock in a marina. The cylinder was to be actuated only a few times a year and was completely submerged in salt water. This meant the shaft was prone to barnacle and crustacean growth over the long periods of inactivity. A metallic scraper ensured the shaft was clean and free of contaminants when actuation was needed. The unique grade of stainless steel in combination with the degradation free properties of PTFE meant a long and effective service life of the scraper could be expected, even in salt water. PTFE would be able to handle the intense heat, but still be pliable enough to allow for misalignment and adequate centering. The addition of the Carbon filler further improved temperature capability and mechanical toughness. Eclipse chose to use a specific, unhardened grade of stainless steel for the metallic scraper. The unhardened stainless steel provided aggressive rod scraping while also reducing the risk of damaging the cylinder shaft. The slim jacket profile also works in minimal hardware space and allows for easy installation. Find out if a Metallic Scraper Ring is right for your application.